Allow me to explain. Boys, you see, all dream of being baseball players. The chances of any given boy making the Majors are, effectively, the same as any given girl’s chances of becoming a Disney princess. The difference is, boys get a chance to learn this at a young age. It’s why they succeed. Some boys don’t make it out of tee ball. By the time they’re five years old, then, they realize that athletics aren’t their thing. They turn their focus to their strong suits — math, Dungeons and Dragons, whatever — and go away happy (or whatever passes for happy for D&D dorks. Point is, they were undoubtedly pushed into tee ball by their Dads anyway). Some boys top out in Little League. This is the level that separates the talented from the hardworking from the coasters. Boys who top out here learn that natural talent varies wildly in any given population, and that hard work can overcome some — but not all — inherited disadvantages. Some boys quit with a sigh of relief — they suspected they weren’t that good, weren’t having that much fun anyway, and now it’s ok, because how in the hell are they supposed to compete with a fifth grader who shaves? High school is next. Here you learn that even the natural athletes have to work hard. No amount of hard work will get you over the minimum talent threshold to compete at this level, and only the insanely naturally gifted can compete here without a lot of hard work. Then college, where every player is insanely naturally talented. And then maybe, after all that, the Minor Leagues…. where everyone is one-in-a-million and only the top 1% advance. See the difference? Unlike “princess,” “ballplayer” has a set of clearly defined, measurable skills that can be tested. And back in the Jurassic, pretty much every boy tested his, whether he wanted to or not. You learn a lot about yourself getting struck out, or tackled out of your cleats, or taken to the hoop, or whatever you call getting beaten to the goal in soccer (“prancing foppishly,” I think). You learn it’s not the end of the world. You learn you have different skills. You learn that wanting something is not the same as getting it, no matter how hard you want. Princesses never learn this. 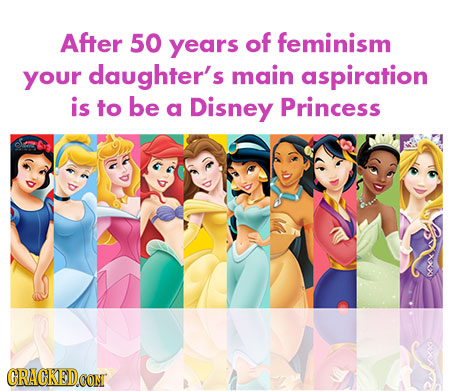 Princesses learn something much, much worse – that if you can’t be a princess, it’s somebody else’s fault. Jack wants to be a ballplayer, but he’s got no arm and can’t hit a curve. He’s got no natural aptitude for it, and if he doesn’t figure that out on his own — some kids have a preternatural ability to endure public humiliation — his coach will eventually take him aside and explain it to him. Coach will kindly but firmly point Jack to the Model UN club. Coaches are good at that kind of thing; they get lots of practice. Jill doesn’t want to be an engineer, but after 50 years of feminism, her mommy is convinced Jill should be one. So Jill struggles in math class. She’s got no natural aptitude for it… but wait, that can’t be right! There’s no such thing as “natural aptitude” for academics! If Jill’s no good at calculus, doesn’t get fired up by solving quadratics, and never wanted to build bridges in the first place, it’s Patriarchy keeping her down. No teacher will ever take Jill aside and explain to her that it’s ok not to be so great at math, that calculus is the mental equivalent of being able to hit a curve — it weeds out most of us — because it’s the end of that teacher’s world if she does. So she doesn’t, and… well, you know the rest. Mandatory Little League. It would solve most of America’s problems at the root. This entry was posted in Uncategorized on September 30, 2016 by Severian. How’s this for obvious: Your reaction to the debate says a lot more about you and your priorities than it does about the debate. I know, I know: that’s exactly the kind of hard-hitting, iconoclastic analysis you come here for. Seriously, though, I didn’t watch the “debate,” as these things have always been clown shows. I was hoping Granny Fallsalot would have actual convulsions right there on the stage, preferably following a juicy Trump zinger about the Clinton Foundation and/or email, but whaddaya gonna do? It sounds like it was basically a wash, and in politics as in baseball, a tie goes to the runner — Granny was default naggy and schoolmarmy; Trump didn’t look like a lunatic; ergo Trump won. This is geared towards the mating world, obviously, but Vox Day has another, much shorter description of Gammas that’s most applicable here: The Secret King. Just as in generic extruded fantasy product novels, the humble dorky awkward farmboy is always the Savior of the Universe, so the Gamma / Liberal is the real hero of whatever situation he’s in, because he has some secret untapped power. The difference between GEFP and real life, of course, is that in real life the liberal believes he has found and activated his secret untapped power: Words! Observe liberals for any length of time — particularly on the internet — and you can’t help but conclude that they really think they’re winning by being snarky and dismissive. They act as if coming up with a really great comeback 20 minutes after getting stuffed into a locker by the quarterback is the same thing as — no, better than!– beating him up in the parking lot. This is anecdotal, of course, but I bet you all have a similar one. Back in the George W. Bush era, I got a liberal colleague literally screaming mad by saying that I didn’t much care what the President’s IQ is. Note that I wasn’t defending W. in the slightest, as known conservatives are ruthlessly disemployed in my field. I simply said that I don’t think a high IQ is the main, or even a primary, qualification for president, and I quoted somebody to the effect that Benjamin Disraeli played cards while Czar Nicholas played chess, and who would you rather have running your country? Horse sense and the ability to shift gears rapidly — the top two things “intellectuals” obviously lack — are far more important. This sent my colleague into Hillary-level conniptions. Part of this was W. specifically — they’d cling to their precious “he’s the dumbest idiot evar!” narrative even if he trounced Einstein in a calculus contest — but a lot of it is their own insecurities. Which leads them to vastly overrate the importance of specifics, details, and especially “debate” performances. While they tuned in and saw a Secret King tying Trump in verbal knots, I’m betting the rest of America saw — and especially heard — a hectoring shrew doing a damn good impersonation of Tracy Flick running for class president of the nursing home. We’ll see. If poll numbers drift Hillary-ward in the next week, she won. But I bet they continue their Trumpward momentum with hardly a pause. This entry was posted in Uncategorized on September 27, 2016 by Severian. But blue pilled people don’t have any virtues, they just want to *signal* virtues. They want someone on facebook to like their post…and that’s about it. Nailed it. This is why I hate the Left so very, very much – they’re grotesque hypocrites. I lived in a college town for a long time — among the bluest of the blue, in other words — and trust me, their personal lives make a Klan meeting look diverse. They even joke about it among themselves, off the record and after a few drinks – everybody knows that the most expensive car in the faculty lot always belongs to the loudest Marxist. They’d no more allow a refugee into their neighborhoods, or their kids into a “transgender” bathroom, than they would allow a military recruiter in class or pass a paper by a known Young Republican. They’re as degenerate as they can afford to be without compromising their nice upper-middle-class lifestyle. But everything’s for sale among them, because they have no concept that life can be anything but a series of symbolic transactions. This entry was posted in Uncategorized on September 24, 2016 by Severian. The “proposition nation” concept isn’t inherently ludicrous. There have been proposition nations in the past. Germany and Japan are two prominent examples, and they show us techniques for welding disparate groups together. Say what you will about the Franco-Prussian and First Sino-Japanese wars, they really got the people behind the government. And “invented traditions” can work wonders — the “ancient” sport of sumo wrestling, for instance, is all of 150 years old. The Roman Empire was famously propositional, as was its “successor” the Holy Roman Empire (and its sorta-successor, the Austro-Hungarian Empire). Objection: But they started with ethnically homogeneous populations! Ok, but there’s considerable variety even within homogeneous populations. Austrians are not Germans, for example…. a fact that has caused considerable consternation to certain Austrians. Ask the world’s most famous one (no, not Arnold Schwarzenegger; the one with the mustache). And of course, rome was ruled by foreigners from early on, and indeed the whole Pax Romana rested on an increasingly Romanized population in the provinces. No ethnic homogeneity there! It can be done. We did it ourselves once. That’s 90% of the pseudo-religious mystical hooey surrounding baseball. It’s the Old West, the Pioneer Spirit, etc. The Grand Army of the Republic, which was the main lobbying organization for veterans of the Union Army, spent almost all of its time in later years propagandizing for Memorial Day (called Decoration Day then), flags in schools, patriotic textbooks, the Pledge of Allegiance, etc. Every town of any size had its GAR post back in the Gilded Age, and if you wanted to know how to be an American, there were plenty of old coots with nothing else to do who would be happy to tell you for hours on end. Imagine if community life centered on the VFW hall; that’s life in the sticks in the Gilded Age. But it can’t be done ironically. The other big nation-welder in the Gilded Age was fraternalism, and you have to be 100% sincere to call yourself Grand Poobah of the Leopard Lodge and march in a parade wearing a cape and fez. Modern life is, of course, nothing but irony. (I know, I know, that’s the New York Times, but seriously – read it). There’s no loyalty without sincerity, and we don’t even know how to be sincere anymore. Try it for yourself. Go watch old Leave it to Beaver episodes on YouTube. Even those of us who think we’d love to live in the 1950s cringe a bit — it’s so fake, so hokey, so cornpone. Except it’s not. That’s what sincerity looks like. You couldn’t remake Leave it to Beaver now if you wanted to – our actors don’t understand that emotion enough to fake it. That’s the social point of no return, y’all. When even those of us who call ourselves nationalists cringe at sincerity, it’s time to hang up your cleats and hit the showers – it’s over. This entry was posted in Uncategorized on September 23, 2016 by Severian. I have in my library a copy of Fundamentals of Marxist-Leninist Philosophy, published in Moscow in the mid-1970s for the edification of fraternal socialist comrades worldwide. It’s a thing of beauty in its way — the commies really believed their flimflam was a science, so they tried to make its foundations as unassailable as those of, say, physics. In fact, the thing starts with physics, or to be more precise, metaphysics. Dialectical Materialism is materialism, after all, since that is the only world in which homo oeconomicus can exist. And so they’re forced to spend a few pages “refuting” the doctrine of the Unmoved Mover. Atoms were put into motion by….something… because reasons. Whatever. Point being, they had to start with the metaphysics, or their whole system collapsed. It’s beautiful, Ptolemaic, breathtaking in its circularity. My copy has many passages underlined. I snagged it from a pile of free books outside the History Department back in grad school, so I have no idea which particular prof it belonged to, but it doesn’t matter. In my mind’s eye eye I see this painfully earnest young academic, peering owlishly from behind his spectacles as he takes meticulous notes on the Glorious Revelation. They were sincere, those old commies — give them that. And they did their homework. Much as Aquinas’s massive Summa contra Gentiles was designed to provide itinerant preachers with pat answers to every possible objection a heathen could raise, so Fundamentals of Marxist-Leninist Philosophy is more than a catechism. I have no doubt that a properly trained and indoctrinated young cadre could tie any one of us in philosophical knots. What a feeble bunch the modern Left are by comparison! Their dogma is Postmodernism, the categorical assertion that there are no facts, only perspectives. Thus math is sexist, race is a social construction, etc. — it’s puerile question-begging that a child could see through, were he not indoctrinated K-thru-12 by Postmodernists. They’ve never in their life argued for their positions; I doubt they know there ever were arguments for them, and wouldn’t care if there hadn’t been. Fundamentals of Marxist-Leninist Philosophy absolutely belongs in Humanity’s reject bin, but what replaced it was something far worse. I actually kinda miss the old murderers. This entry was posted in Uncategorized on September 21, 2016 by Severian. I wonder when the Alt-Right will get around to embracing George Fitzhugh? Not the most prominent American intellectual, even in his time, but he was a fairly big deal back then. Most of their 19 (or however many they’re up to now) points can be found in his work. Of course, he writes well and isn’t a sperg, so he’s no use in the internet age. How Will We Know When Panic Becomes Terror? Some bold souls, like yer ‘umble narrator, have been predicting a Trump blowout victory for some time. But now the polls are looking better and better, Granny McFallsalot keeps doing the Involuntary Macarena in public, and it’s finally coming to the public’s attention that all this “Obama birther” stuff was started by Hillary herself. The Media aren’t taking it well. Still, they’re only in panic mode now. Right now, the race is only “increasingly tight.” What happens when it edges into “Clinton is trailing,” and then to “Trump is cruising”? This entry was posted in Uncategorized on September 17, 2016 by Severian. I live for stuff like this. Seriously — this is why I study history. Pick any sufficiently advanced society, and you see things in its history that are so bizarre and brain-dead it makes you wonder how the first hominid ever managed to climb down from the tree without getting immediately devoured by a T Rex. There’s still a very good chance we’re going to make this seizure-prone imbecile the President of the United States. The ol’ “I meant to do that!” is pathetic and embarrassing coming from a twelve year old nerd who just pissed his pants onstage at the spelling bee. It is, in fact, this type of situation that teaches most of us — hopefully by seeing it happen to someone else — the famous First Rule of Holes: when you find yourself in one, stop digging. The entire Media spent all last week frantically spinning Zombie Evita’s gork-out as “powering through” a bout of pneumonia (and no, there’s nothing at all suspicious about every single journalist using that exact phrase). Incredible as it seems, there are still lots of low-info types out there who either pay no attention to the news, or just sufficient attention to see only the spin. It’s possible — not probable, at this late date, but possible — that Hillary indeed could have “powered through” her involuntary Weekend at Bernie’s cosplay episode had she simply shut up about it. But then she goes out and reminds whatever supporters she has left that yes, indeed, she’s got major health issues. What a moron. And yet, whatever else happens, she’s going to get at least 40% of the popular vote. Freud said something about all people and societies having a death wish. The more I see of this election, the more I think the old cokehead was really onto something. But whatever — no matter what happens in November, you can’t say we don’t richly deserve it. This entry was posted in Uncategorized on September 16, 2016 by Severian. I just did, and now I feel dumber, for a) wasting a single brain cell on anything comic book related, and b) not getting it earlier, and c) wondering why I care about any of this in the first place. It’s like I simultaneously learned several new facts, and lost a few IQ points. Anyone? There must be something in German…. This entry was posted in Uncategorized on September 12, 2016 by Severian.